A 155 million year old fossil was discovered by local collector Kevan Sheehan between 2003 and 2008 as it gradually tumbled out of the cliffs near Weymouth. The fossil was found in Dorset, but it has taken 18 months to remove the creature’s skull from its rocky casing and is believed belonging to one of the largest sea beast called pliosaur the most fearsome predator to have ever lived in our oceans. The lengthy preparation process of putting it together has been carried out by fossil expert Scott Moore-Faye which accordingly revealed the fine details of the fossil. Richard Edmonds, Dorset County Council’s earth science manager for the Jurassic Coast said, that they are amazed, they saw this fossil as a pile of bones and slowly, after a lot of hard work, it has come together. The creature’s fossil which is on display at the Dorset County Museum which scientists suspect it as a new species or even genus. 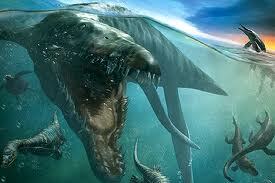 Pliosaurs were the top predators of the oceans. Looking somewhat like a crocodile on steroids, it is now easy to see the power of this ‘biting machine’, which lived during the Jurassic and Cretaceous Periods. Its bulky body, which would have been powered through the water with four paddle-like limbs, has never been found, and may not even have fossilized. But new estimates from scientists, based on the 2.4m-long skull, suggest that the predator would have measured between 15-18m from tip to tail. Palaeontologist Richard Forrest considered it as an iconic specimen, one of the most exciting they have seen in years. Currently, the owner of the title of world’s biggest sea monster is tricky to ascertain, as it is rare to find a complete fossil. The pliosaur from Dorset is big, but perhaps not the biggest. However, scientists say that having a skull that is only missing the tip of its snout and a small piece of its jaw, gives them a rare chance to get a glimpse into the life of this ancient animal. Probing the fossil using CT scans carried out by a team at the School of Engineering Sciences University of Southampton, are now being studied to assess whether this creature is new to science. David Tucker, Dorset County Museums Adviser said that their initial expectations have been more than met and the creature looks absolutely fabulous and they doubt whether there is a more complete pliosaur skull anywhere in the world.